Antique Lighting from The Drawing Room of Newport Antiques of Rhode Island. Item # 5119. A pair of Argand lamps. Henry Hooper of Boston. Item # 5119. A pair of Argand lamps. At first look, these do not look like Argand Lamps, but on closer examination, they were at one time. They have succumbed to the hacksaw of the 1930's 'lamp shop' when they were fitted for electricity. First: the manufacturer was Henry Hooper of Boston. 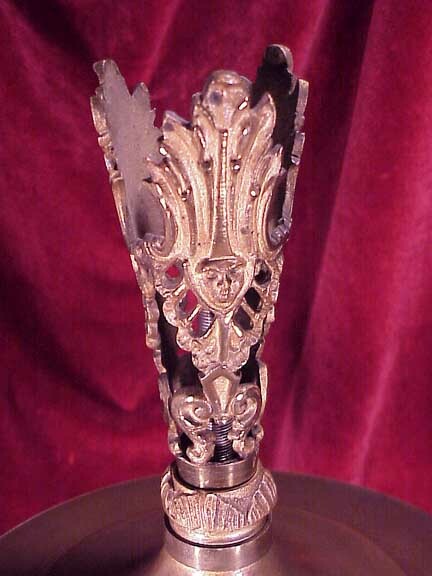 Heavy cast bronze. 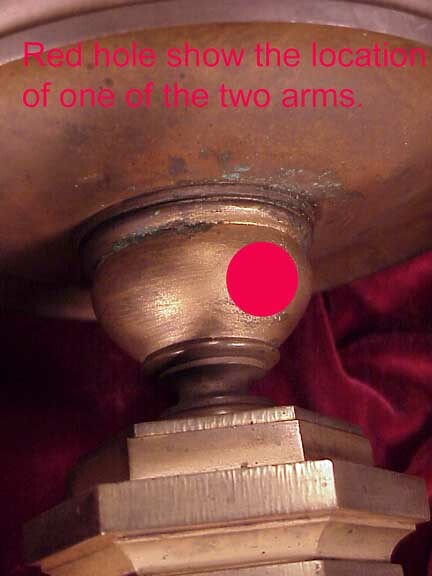 The central form behind the prisms supported a pair of arms which have been cut and disposed of. 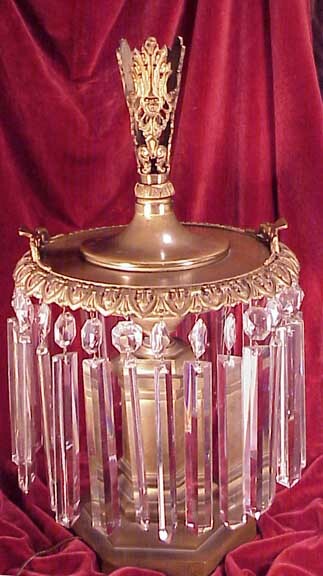 The central top trumpet pierced section held a glass vase. 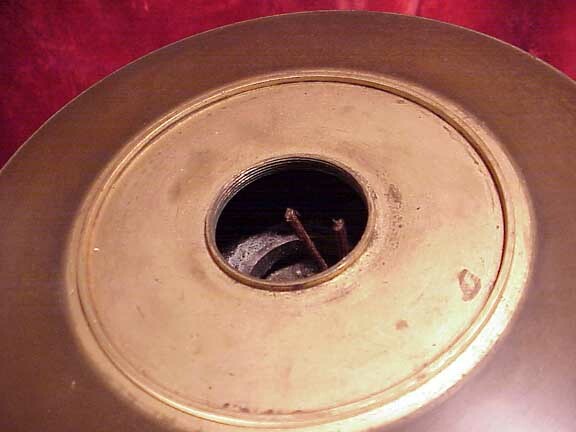 To fill the lamp: you probably removed the glass vase and trumpet holder and added oil; the convenience of not having to remove the heavy prism ring was a novelty at the time. 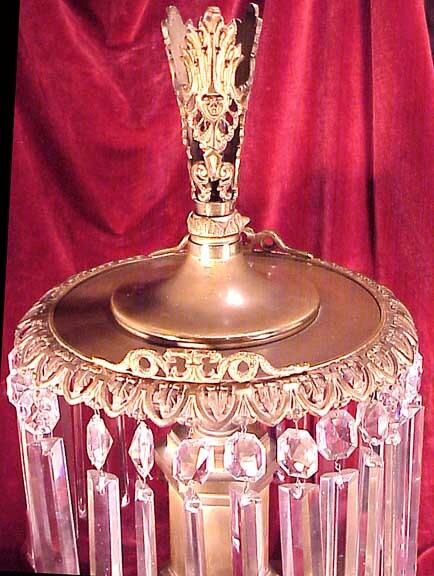 Size: 18" tall to the top of the pierced trumpet; 10" across the prism ring and 12" tall to the top of the prism ring. So . . . this is a project: arms and burners must be found and soldered to the main body; glass trumpets must be found that fit correctly and of course 4 (two for each lamp) appropriate shades must be acquired. The prisms: about 3/4's of them appear to be period; the rest are about the same length, but a different style and probably later additions. The patina is very worn. The restoration will take a lot of effort; however, very few of this form of Argand has survived. We know of no complete example. Price as they sit; for the pair: $5,500.00. 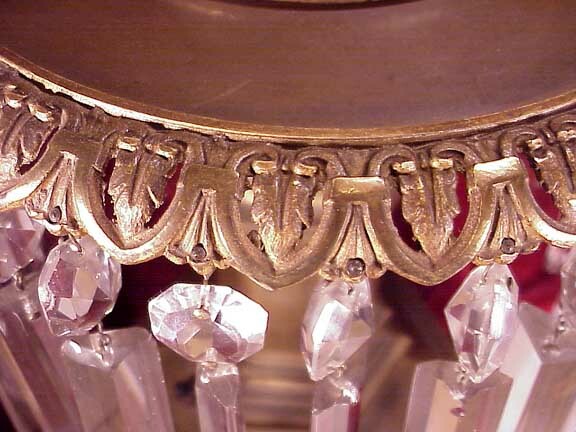 The decoration for the prism ring is very Greek Revival is style. 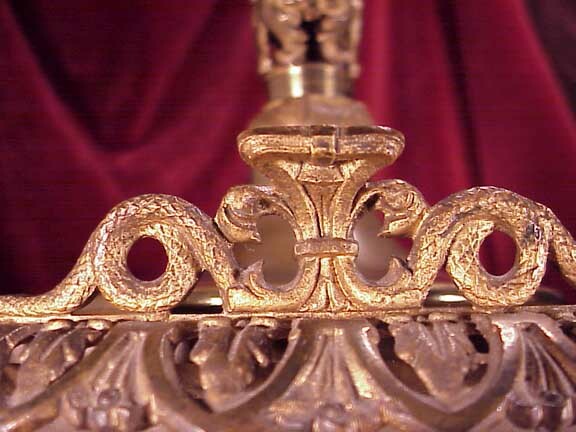 Each lamp had a pair of arms which were cut and filled. Viewing inside the font: it still smells of the original oil with green corrosion evident inside. 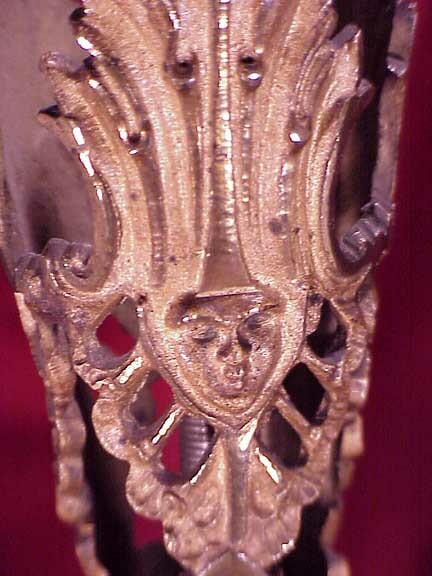 The stylized head is indicative of a Hooper decorative element. The glass trumpet vase was probably between 10" and 14" tall. The sturdy base is formed from a six sided pedestal which is about 6" across making the lamp very stable.